An arboretum is not a simple park, but a botanical garden dedicated to trees and shrubs. An organized system aiming at the study, growth and preservation of precious and possibly endangered species and ecotypes. The experimental arboretum of Mondaino, was inaugurated and opened to the public in Spring of 1990. Today, this open-air laboratory collects about 6000 plants. That’s why we found it natural to associate education and environment, particularly in the interest of the children. For them the arboretum is a space where nature can be experienced through play, art and creativity. In the park you can listen to the soundscape; you can create toys or little characters with the forest’s natural “leftover” materials; you can smell and touch. You can look up or leave your footprints on the ground, chase shadows or hide among the trees. You can find a spot that is totally still, a ladybird, a butterfly and a feeling you may want to draw, once back at school. 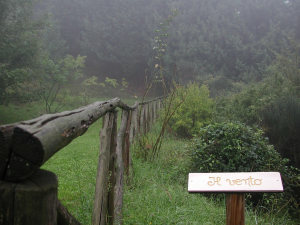 Furthermore the Environmental Education Centre (CEA – Centro di Educazione Ambientale) is a place that can host important research projects in collaboration with universities. A group of qualified professionals, a lecture room, a thematic collection of the arboreal species and a specialized library are at the disposal of visitors. In Autumn 2001 our association re-opened seven forest trails. Walking along those trails you can spot some well-defined areas. 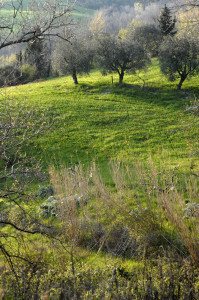 Among the most interesting ones, from the point of view of the natural landscape, the oak woods, the riparian vegetation (growing along the “Tafuggia” ditch) and the thickets. They are all typical elements of the gullies that once were agricultural lands, found in the areas in the outskirts of Rimini. The Genista is among the most common species of shrubs found here. In the section dedicated to the Pinaceae we mostly find pine and cedar trees, along with a good number of other conifers, which, although not always in good vegetative conditions, are anyway interesting from an educational point of view.Along the windy trail at the centre of the arboretum, we have a chance to observe and study various arboreal species – divided into different beds – that normally don’t grow in this area, all belonging to the oak family. Finally, we find various species that are typical of the Mediterranean scrub which although alien to the local landscape, are in very well kept vegetative conditions. Respect for nature is a must. In order to heighten our environmental awareness, we only need to adopt a few small tactics. We refrain from making loud noises and from any act of vandalism. We don’t ride bicycles a nd motorcycles on the lawn and along the forest trails. We don’t pick flowers, we don’t break off branches from the trees, we don’t make engravings on tree trunks. Pets should be kept on a leash and under the owner’s surveillance. If we get the opportunity to see wild animals, we should behave with respect and discretion, trying not to disturb nor scare them, and without chasing them. Let’s take this chance to enjoy remaining in silence, instead. If we use the picnic area we should clean up after ourselves. We avoid throwing garbage on the ground, even in case of biodegradable waste; we neither try to burn it nor to bury it, but we use the appropriate waste bin. We don’t start fires, especially not on windy days. Fire spreads easily. It is advisable to wear appropriate clothing to walk on the trails (and shoes have their importance too). We suggest you to take the trail map with you and a camera: when we are in nature we can take the time for a break from all other devices of our technological civilization. 29. Acero di monte 30. Acero atropur.